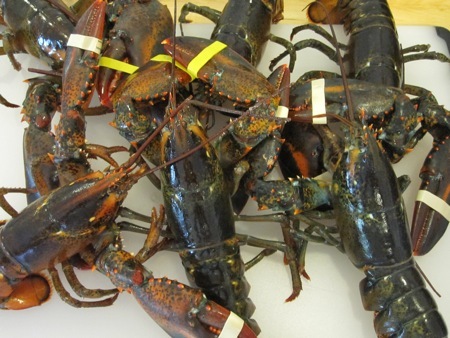 New Englanders can get downright religious about how their iconic seafood dishes are prepared. Fried clams must be whole, not strips. Chowdah is made with milk, clams, and potatoes, not that tomato soup with clams that they serve in New York City. And lobster rolls should be made with lobster, a bit of mayo, and a smattering of diced celery, served on a grilled top-split flat-sided hot dog bun. Anything else is just fancying up the dish to make it cost more. The lobster roll dichotomy in Boston is best exemplified by the $15 classic served at Kelly’s versus the $27 upscale inerpretation found at Barbara Lynch’s B&G Oysters (you can see it in the slide show on the splash screen). , which nicely split the difference between upscale and barebones. 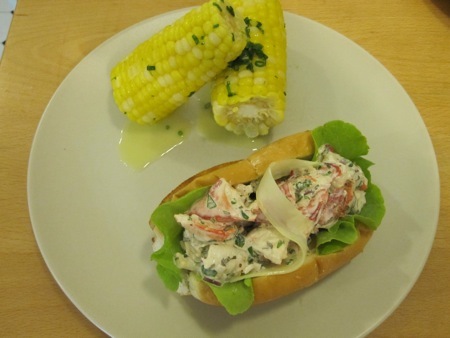 Any lobster roll recipe must start with good lobster, and so did I. Greater love for his family has no man than that which causes him to be out of bed and in a supermarket on a Sunday morning at 8 AM. 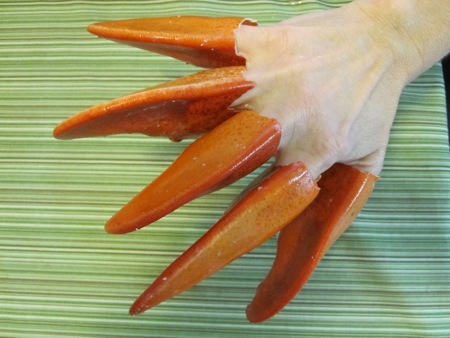 I bought six soft-shell lobsters, which weighed in at seven and a quarter pounds. I steamed them for ten minutes and let them cool. An hour (and one Benadryl) later, I had a yield of twelve ounces of tail meat, six ounces of claw meat, and three ounces of knuckle and leg meat, a mere eighteen percent of the total weight. 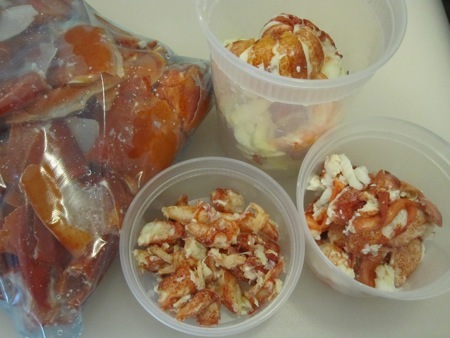 I also had a bag full of lobster shells for stock. 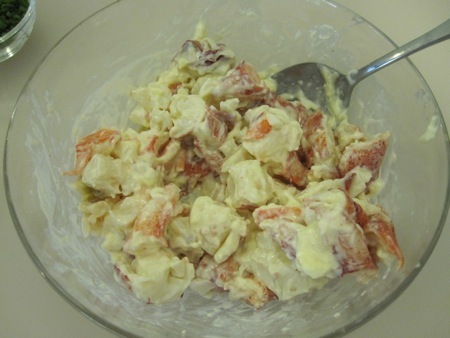 I mixed the mayo and lobster together to coat. I added the onion, celery, tarragon, chives, parsley, salt and pepper, and stirred to combine. I squeezed the lime over the mixture, gave it another stir, then covered it and put in the fridge while I started on the corn. 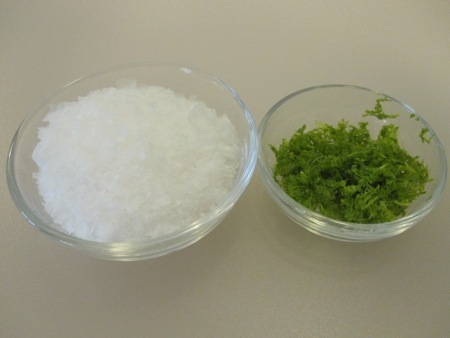 Lime salt is easy. Start with a quarter cup of Maldon sea salt and the zest of one lime. Mix them together in a jar (I used an empty spice jar with a large-holed shaker top) and store it in the freezer until needed. 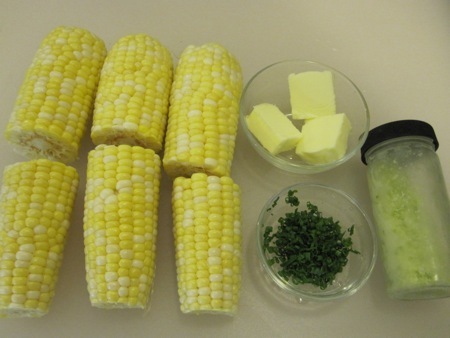 To make the corn (again, a half recipe), I used three ears of sweet corn cut in half, three tablespoons of unsalted butter at room temperature, tablespoon of chopped chives, and the lime salt. I boiled the corm for five minutes. 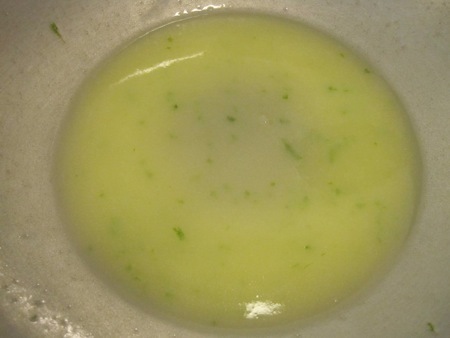 While it cooked, I put a tablespoon of the cooking water in a large heatproof bowl, then added the butter and swirled over medium heat until the butter emulsified (making a beurre monté). I swirled in the lime salt to taste. 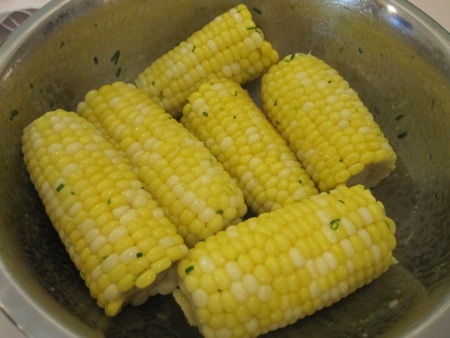 When the corn was ready, I tossed it in the butter and added the chives, tossing again to coat. 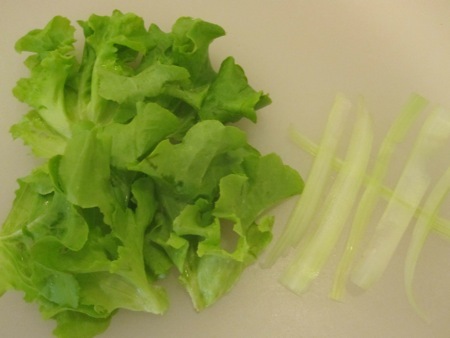 While the corn cooked, I cut and washed some lettuce leaves and used a peeler to cut celery ribbons. 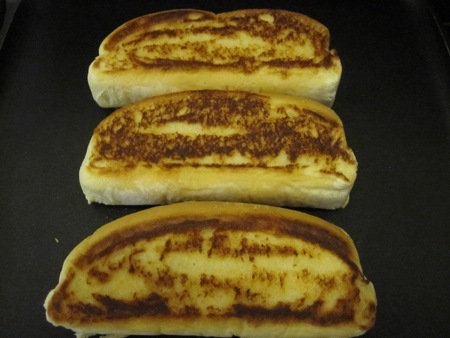 Lastly, I toasted the hot dog buns on a buttered griddle. To assemble, I lined the inside of each bun with the lettuce leaves, spooned in the lobster salad, and topped each roll with a celery ribbon. I served each roll with two pieces of the corn. As lobster rolls go, this one was quite tasty without being as heavy as the straight-up-with-fries version. 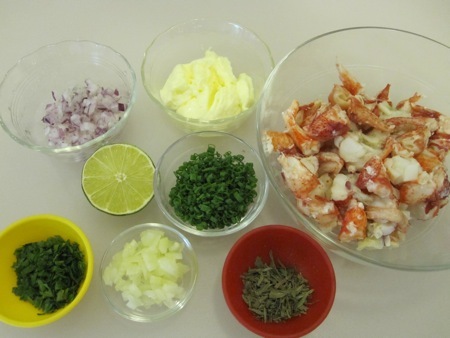 The tarragon accented the natural sweetness of the lobster while the chives and onion provided a bit of bite. There was just enough crunch from the celery, and the lettuce kept the mayo from making the bun soggy. As for the corn, this is my new favorite preparation method. The lime added just enough subtle acidity to cut the sweetness. I may add a bit of chile powder the next time, but this version is worth making again and again. What about the rest of the lobster? I kept it in the fridge for the next meal, which is the subject of tomorrow’s post. I was always under the impression that a classic New England lobster roll was made with butter not mayonnaise. And while I may be in China right now, I did eat some lobster rolls in Marthas Vineyard and Maine this past summer. What say you? Nope. A classic New England lobster roll is a split-top hot dog bun toasted in butter, with a filling made from lobster meat, celery, and mayo. 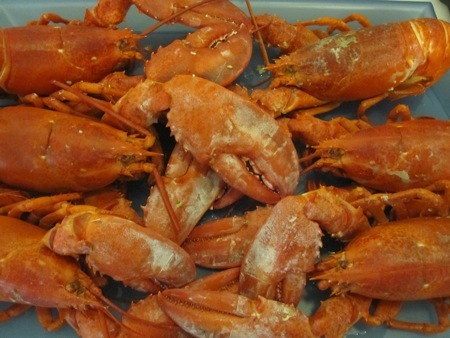 I can’t imagine how a butter/lobster mixture would stay creamy when it’s chilled.